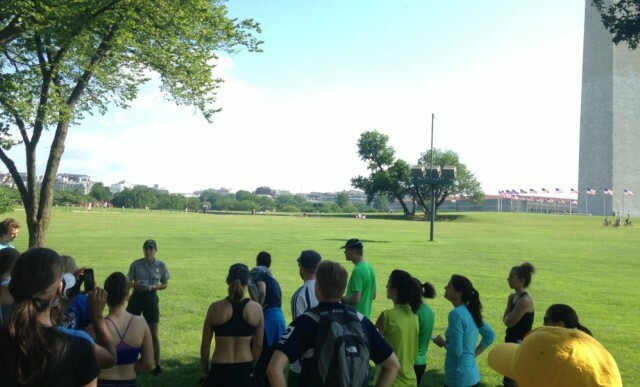 History buffs might outnumber runners in D.C., but the National Park Service ranger runs blend the two popular aspects of capital culture. “What a great concept,” said Russell Briggs, of Syracuse, N.Y. He’s in town for a project with the U.S. Forest Service, and he saw the sign for the run on his walk home from work. Selecting shareable facts from the massive amount of information about the monuments requires Cochran and other rangers to account for the composition of the group. Many of the 30 people at the June 14 event came from across the country. Colleen Gaffney grew up in the area as a child, but she now lives in Orlando, Fla.
“I couldn’t wait to introduce my kids to the city,” she said. The rest of her family waited in line for tickets to go up into the monument while Gaffney joined the morning run, which meets rain or shine at 8 a.m. at the Washington Monument lodge on 15th Street. The group averages around a 9- to 10-minute mile pace with routes that last about an hour and a half. The Flag Day run included the Smithsonian Castle, the south lawn of the White House, the World War II Memorial and the Jefferson Memorial. Barras lives in Texas but is moving to D.C.
As promised, the routes include plenty of history lessons. For instance, buffalo once grazed on the lawn behind the Smithsonian Castle when the National Zoo first started on the Mall. At the World War II Memorial, a local runner can easily overhear comments about the strange layout of the state pillars. Anyone joining the ranger run would learn that the seemingly random arrangement is a deliberate placement based on when the state entered the Union. Looking east toward the Lincoln Memorial, Delaware leads the way on the left. The order then ping pongs back and forth from left to right around the oval plaza. Plenty of locals joined the run sporting shirts from familiar area races. These people in particular drive Cochran and other rangers to find a diverse set of trivia. Sepp Scanlin, of D.C., started volunteering with the runs at the opening of the 2014 season. Ranger runs started as an addition to the Cherry Blossom Festival, and in 2010, the popularity of the event prompted the National Park Service to add summer dates. The program now takes place March through October on the second and fourth Saturdays, with some breaks for major holidays. Even though Scanlin has assisted on many runs, boredom hasn’t set in yet. The next ranger run will happen on June 28 with a Thomas Jefferson and John Adams theme as an early celebration of Independence Day.